Editor's Note: The Petersen House will be closed from December 25, 2017, to June 2018 for preservation work. In the years leading up to April 1865, William and Anna Petersen, both German immigrants, owned and occupied the Petersen House. They raised 10 children on the second and third floors of the home, while opening the basement and first floors to strangers. Each person boarding at the house had a different reason for needing a bed. Before the wounded president was ever carried inside, previous boarders with connections to Lincoln had passed through. As Lincoln lay diagonally across a bed in the far back of the house, Secretary of War Edwin Stanton went to work establishing a command center in the back parlor of the Petersen House. 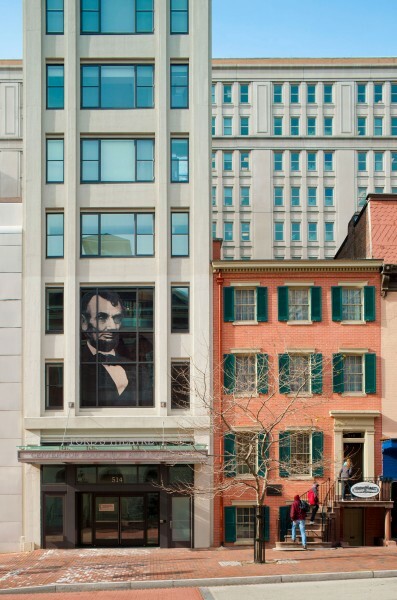 In that adjacent room, Stanton controlled all news of Lincoln’s condition, prepared the oath of succession for Vice President Andrew Johnson and began the hunt for John Wilkes Booth. Important men moved in and out of the room all night, including Attorney General Joshua Speed, Chief Justice of the Supreme Court of the District of Columbia David Kellogg Cartter, and various members of the President’s cabinet. 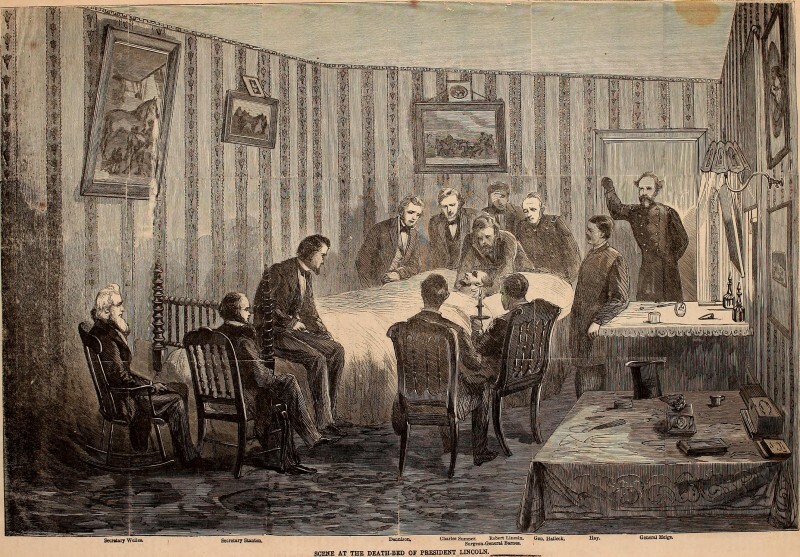 Harper's Weekly "Scene at the deathbed of President Lincoln" in 1865. Library of Congress image: https://www.loc.gov/item/scsm000763. The front parlor became a room for Mrs. Lincoln to grieve, after Secretary Stanton determined she was too disruptive to the President’s care. There, Mary was joined by friends, as well as assassination witnesses Major Henry Rathbone and Clara Harris, who attempted to calm her. Robert Lincoln and actress Laura Keene also visited periodically throughout the night. Mixed in among Lincoln’s attendants were the boarders who rented rooms in the house. The room where Lincoln died was being rented by William T. Clark, a former soldier and then clerk in the Headquarters of the Adjutant General; Clark was not home that night. He returned the next morning to hear the news and find his room in disarray. The parlors that Stanton and Mrs. Lincoln used through the night were typically rented as a unit by the Petersen’s; reports say that there were a bed and washstand in the back parlor while Stanton gave orders. Renting rooms that were not formatted as bedrooms allowed the Petersen’s to bring in more money and gave them the ability to offer differing room options to boarders. A letter written by a boarder named George Francis explains that he and his wife occupied the unit, and city directories confirm he was living at the Petersen House in 1865. Others say that the Ulke brothers were renting the front parlor; the brothers took a photograph of the death bed on the morning of Lincoln’s death. While it is not certain why these boarders chose the Petersen House specifically, staying in a boarding house was common. Census records show that almost half of the residents of Washington, D.C., during the mid-1800s were either tenants or owners of boarding houses. Immigration, coupled with the push from country to city, created a need for housing in metropolitan areas such as New York City. Boarding houses filled that void by providing a room (or two) and three meals a day. Among the groups to use boarding houses were congressmen. Congress was only in session for a few months out of the year, leaving lawmakers in need of temporary housing near Capitol Hill. Boarding houses offered not only places to stay, but spaces to foster relationships within and across party lines. Petersen House is pictured on the right. Photo © Maxwell MacKenzie. While serving as a U.S. Representative, John C. Breckinridge, who ran against Lincoln and Stephen Douglas in the 1860 presidential election, boarded at the Petersen House. City directories and personal papers establish that he was there in 1852 and 1853. While there, he occupied the double parlors as a unit, exactly as George Francis and his wife reportedly did. In February 1853, Breckenridge wrote a letter saying that a friend would soon “occupy a room with Waller Bullock next to mine, and board at the same house with me.” Based on the letter and the floor plan, it can be deduced that Bullock was also staying at the Petersen House—specifically in the room where Lincoln died. Waller Bullock was Lincoln’s uncle-in-law. The Petersen House was one of many similar, ordinary buildings on 10th Street between E and F Streets in the mid-1800s. Neither the Petersens nor boarders could have predicted how their lives would be linked to Lincoln forever after April 15, 1865. Visitors to the Petersen House today can walk through the first floor, which includes the rooms where these lives, and countless others, were intertwined. Courtney Kuzemchak is former Ford’s Theatre Exhibitions Intern. A native of Pennsylvania, her love of the 19th century started with trips to battlefields and brass band concerts.